This is an experiment. Not a vector, but also something I wanted to try. I used a scan of Rukia found around this site some time ago. 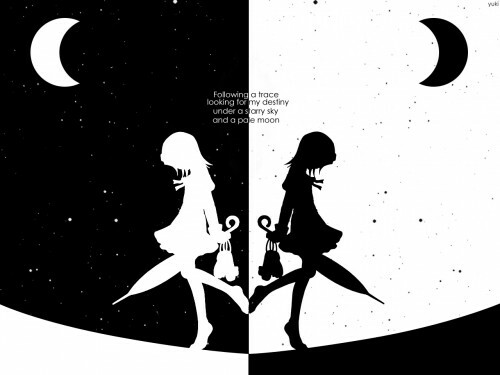 I know it's simple, and a little plain...and I also know that the moon and the stars don't fit very well with Rukia ('cause she has an umbrella) but in some way, I like how it looks like. Thats great wall! thanks for sharing! It's really beautiful...I love black and white alot..
i love it.. it's simple + cute! you'r experiment gave me a good idea, thanks a lot! This is great. I love black + white, but black+white+Rukia= Awesome! this wall is awesome...definitely underrated one of my faves glad i clicked on it. black and white whitch one to choose?